It as been a while since I have had a brew from beer #245’s brewer, Philadelphia Brewing Company. That beer was #64, Fleur De Lehigh and it was a bad experience being the beer was actually spoiled. Lets hope today’s beer, and I’m sure I won’t have a repeat experience, is better. Kilty Pleasure is today’s beer of choice and it brewed in the style of a Scotch Ale or Wee Heavy. The ABV of this traditional Scottish brew comes in at a hefty 8%. The color was a dark brown with a nice red tint to it when it was held up to the light. It had a nice sized mocha colored head. The nose was slightly sweet with caramel malts, brown sugar, and molasses. At times I thought I got an aroma similar to the raw dough from chocolate chip cookies. This was a malty flavored brew with a hint of smoke. Caramel and a bit of vanilla lead off in the taste being just slightly sweet. That slight smokiness and a raisin-like flavor come in to play near the back end of the mouthful. There was just a hint of bitterness in the medium bodied beer. The carbonation was on the lower side. The ABV was hidden well here. This was a solid beer from the city of brotherly love…unless you are a Cowboys fan. Cheers! Why is it that an HP Proliant DL380 G3 server has to way like 100 pounds? OK, it may not actually weigh that much but it sure seems that way after moving and installing one today. I’m quite proud of it as it is my “baby”. It is the first one I have built and tweaked to my work places standards. I think I will celebrate…with a beer of course. 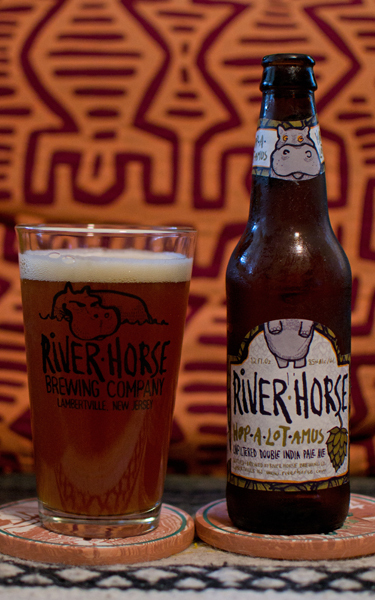 Beer #242 is Hop-A-Lot-Amus by River Horse Brewing Company from Lambertville, New Jersey. They brew this American Double IPA with an ABV of 8.5%. River Horse just might be the closest craft brewer to me…check that…it may be Triumph in Princeton. Oh well…lets get tasting. Very nice beer and I think one of the better ones from River Horse, if not their best that I have tasted. Shame it couldn’t reach that Kingly promised land but the nose for me knocked it down a peg or two. Either way, if you dig Double IPAs, I think you would like this. 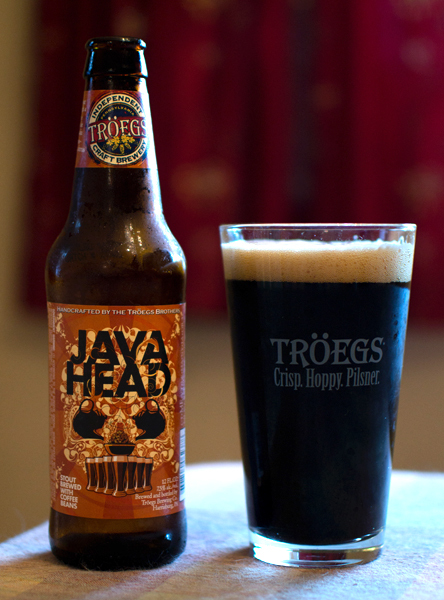 Onwards we roll to 365 and in that pursuit I would like to introduce beer #241, Java Head by Troegs Brewing Company. 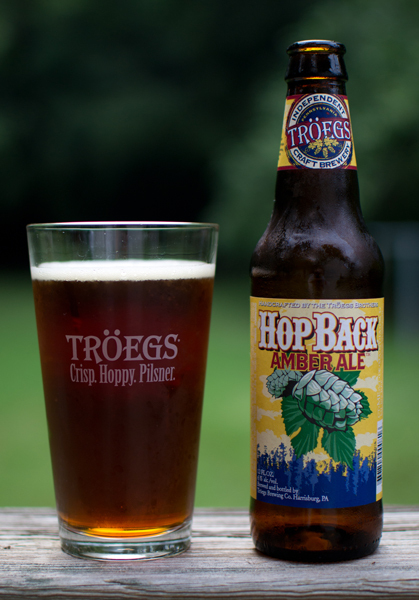 Troegs brews in Harrisburg, Pennsylvania. This Oatmeal Stout has an ABV of 7.5%. 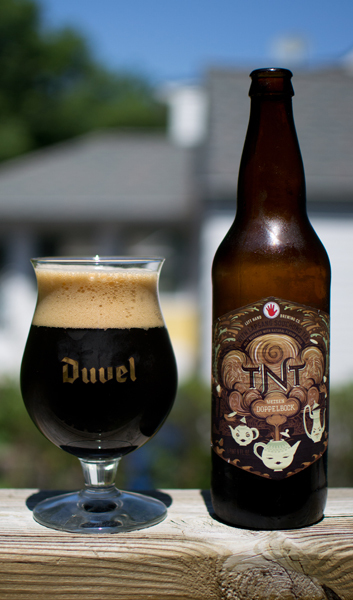 Of note on the bottle it mentions this is brewed with coffee beans…hence the Java in the name. I had a Troegs pint glass, so into it went this black brew with a nice light brown head that left beautiful lacing on the glass. The nose reminded me of a iced-coffee with a nice smoky earthy thing going on. There was a bit of a distant cocoa aroma along with some vanilla. I love coffee, so this smelled nice to me. I took a sip and got those dark roasted coffee flavors up front…there was no mistaking that. Towards the back end of this was a nice hoppy pine like flavor. I didn’t get any chocolate in the taste but there was a vanilla sweetness here which complimented the dark roastiness of the coffee. It had a medium body with lower amounts of carbonation. It was smooth and creamy and very drinkable. Alcohol? Hidden nicely. I liked it quite a bit, I wished I had another. Good stuff from Troegs, especially if you dig coffee. I must say, it is so nice to have good beer again. All good thing must come to an end. OK…maybe not everything that comes to an end was good. Take for instance this Horny Goat fest. This was down right bad. So lets finish this fest and move back on to real beer. Beer #240 is Red Vixen by Horny Goat Brewing Company. This Vienna Lager brewed once more in Wisconsin, has an ABV of 5.4%. Nothing to see here folks…move along. This was a horrible beer from a horrible craft brewer. I am happy that the Horny Goat fest is finally over. With an average somewhere between a D and an F, it would be wise to spend your money elsewhere.